President Barack Obama awards the 2013 National Medal of Arts to Billie Tsien, second from left, and Tod Williams, left, architects, from New York, during a ceremony in the East Room at the White House in Washington, July 28, 2014. Standing before a crowd gathered in the East Room of the White House on July 28, 2014, President Barack Obama recognized the contributions made by those he was honoring with the 2013 National Medal of the Arts and National Humanities Medal. During the ceremony, though, he may have been looking ahead as much as he was looking behind. Two National Medal of the Arts recipients that day, architects Tod Williams and Billie Tsien, are now an essential part of adding texture and creating not just a moment, but a monument, to the 44th president that will house for decades to come his essential contributions to the American experience. The Obama Foundation announced that the New York architecture firm headed by the husband and wife team of Williams and Tsien will lead a group that includes Interactive Design Architects from Chicago to create the Obama Presidential Center. “Tod and Billie’s past projects display an incredible commitment to scale, craft and materiality, and their proposal demonstrated an equally genuine commitment to also carefully balance an understanding and respect for the history and potential of the South Side,” Obama Foundation Executive Director Robbin Cohen said in a press release to reporters announcing the selection after a nearly year-long review of proposals. The tradition of creating a presidential library and archive, facilities which not only house important papers, but also serve as a museum dedicated to the life and service of that president, dates to 1941 in Hyde Park, New York, when then-President Franklin D. Roosevelt established a modest facility to house his presidential material at his family estate. The FDR Presidential Library and Museum is celebrating its 75th anniversary. “Roosevelt’s was on a much smaller scale,” said University of Louisville Associate Professor Benjamin Hufbauer, author of the book Presidential Temples: How Memorials and Libraries Shape Public Memory. “His building, when you adjust for inflation, I think would have cost about $8 million in today’s money,” he said. FILE - (L-R) U.S. First lady Michelle Obama, former first lady Barbara Bush, former first lady Laura Bush, President Barack Obama, former President George W. Bush, former President Bill Clitnon, former President George H.W. Bush, former President Jimmy Carter, former first lady Hillary Clinton, and former first lady Rosalynn Carter arrive at the dedication for the George W. Bush Presidential Center on the campus of Southern Methodist University in Dallas, Texas, April 25, 2013. How much will project cost ? 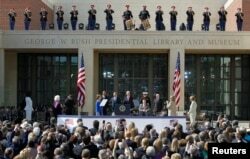 Hufbauer said the scale and cost of presidential libraries have ballooned since then, the most expensive one being the latest — the George W. Bush Presidential Center in Dallas, Texas. “In terms of money, when you count the endowment and everything else, we’re talking more than $500 million,” he told VOA. Even without seeing a design plan, Hufbauer expects the Obama Presidential Center to exceed that amount. 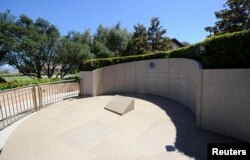 FILE - The burial place of US President Ronald Reagan is seen at the Ronald Reagan Presidential Library in Simi Valley, California, June 28, 2012. “Generally speaking, since the Reagan library, presidential libraries have cost twice what the predecessors have cost,” noted Anthony Clark, former congressional staffer and author of the book The Last Campaign: How Presidents Rewrite History, Run for Posterity & Enshrine Their Legacies. Where will funding come from ? Once a presidential library is built, the National Archives and Records Administration, or NARA, takes ownership of the part of the facility that houses the museum and archives, partially paid for by the endowment created during the fundraising process, and through taxpayer dollars.Some estimates put the taxpayer cost to operate the 13 separate presidential libraries and museums under NARA’s oversight at around $75 million a year. But Clark says it’s probably somewhat higher. “According to my research it’s $1 billion a decade,” says Clark, which works out to about $100 million annually. The long road to a fully operational Obama Presidential Center has several obstacles to overcome, the first of which is meeting whatever the fundraising goal might be, a process Clark said hasn’t really started in earnest. While the fundraising effort has yet to pick up speed, the exact site where it will be located on the South Side of the city of Chicago, where the Obamas lived prior to the White House and still own a home, has not been finalized. “The other problem is there’s a possibility of organized opposition,” said Clark, mostly from the Chicago group “Friends of the Park,” which led a successful effort to force filmmaker George Lucas to abandon his plan to house the proposed Lucas Museum of Arts on Chicago’s lakefront. “Friends of the Park” also is against two potential sites outlined in the University of Chicago’s successful bid for the Obama Presidential Center — 8.5 hectares in Jackson Park and 9 hectares in Washington Park. “Don’t assume you are going to get your presidential library where you initially thought it was going to be,” Clark warned. While the search for the architects may have ended, the Obama Foundation is still setting up a project management team to handle other aspects of the eventual design and construction of the Obama Presidential Center. Author Anthony Clark said the expectation is to have the facility completed by 2021, so the archives can begin public access requests for presidential records and documents on the first day they are available to the public, which is five years from the day Obama departs the White House in January 2017.